Happy Monday and welcome to a new Vainshame.com series to start your week off right! Many know the names of some of the best players in the world, but do you know their stories? Who they are and how they found themselves on the leading edge of a new eSport? Our goal is to give you insight into the backstory of some of the top-tier competitive players who you know and love. We’re going to be toying with the format of these articles over the course of this series, so please feel free to critique and comment how you would like to see us handle them in the comments below. 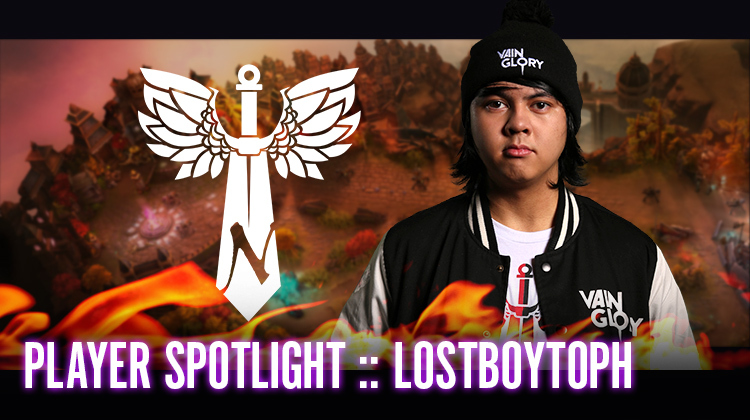 This week’s player spotlight took the form of a Q&A session with NA Nemesis Roamer LostBoyToph. 3. When did you start playing Vainglory? 4. When you first started, did you think that Vainglory would become a top rated eSport? When I first started playing Vainglory I had a feeling that this game would grow and become popular. There was no other MOBA on the App Store that could top it. It’s just so fun and addicting and there’s so much competition. 5. Tell me a little bit about how you wound up playing Roam, and why you enjoy it. When I first started out I tried playing all roles and trying to get an understanding on what each role and hero can do. I realize I can work with anyone with my knowledge and experience. I feel like you need to know how the other roles work to be able to roam well for your team. I decided that roam suits me and I enjoy supporting my team. I feel that roam is an important role for positioning team fights and protecting the carries. 6. What is your favorite experience that playing Vainglory professionally has allowed you to have? My favorite experience playing Vainglory professionally is getting the opportunity to fly out and play competitively at live events and being able to connect with players around the world. 7. Looking towards the future, what are you hoping to accomplish over the next two seasons? Over the next two seasons I’m hoping to make it to the top 8 teams and continually compete at the live championships. I really want to show that roamers can also make good plays. 8. Who is your favorite non-teammate player to party with and why? My favorite non-teammate player to party with is my friend iAmThirsty. I met him near the beginning of the North America launch. He’s a funny and cool dude and we always try to have fun when we play together. He’s really a good player. One of the GOATs of Vainglory. 9. How did you come to use your gamertag/IGN? I came up with my IGN by one of my inspirations Dante Basco, who played as an actor in the movie Hook and was a lost boy and Peter Pan was one of my favorite childhood movies. He’s also a voice actor in Avatar the Last Airbender, one of the characters that I liked was named Toph and it was also part of my name. I consider myself as a lost boy so I call myself LostBoyToph. 10. What is your favorite thing about Vainglory guild life? My favorite thing about Vainglory guild life is that I can connect with my guild mates and share a little about my personal life. 11. What is the most useful advice someone has given you to improve your gameplay? The useful most advice someone has given me is to just do your best with whoever you team with and try to focus on your own gameplay and learn from your mistakes. 12. If you could give any advice to new or rising competitive players, what would it be? Advice I would give to new and upcoming players is to keep cool and don’t be salty. Did you like what you saw? Would you like to see more? Reach out via Twitter to @VGskipper587 or @Vainshame to request future interviews, suggest format changes, or just generally chat with us! Or you can drop us a line in the comments below.